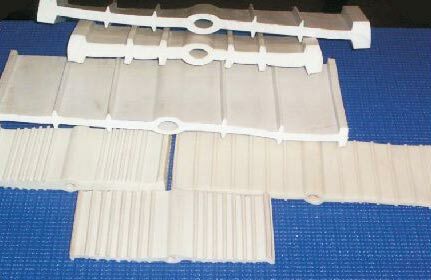 Pvc Water Stop is a profile, based on specifically formulated plasticized PVC composition. Pvc Water Stop are used in concrete masonry construction of hydraulic structure to safeguard from hydrostatic pressure & water seepage. PVC Water Stop also withstands expansion or construction of joints and takes care of any deflection or displacement arising due to change in temperature or settlement of foundation eliminating danger of cracks. PVC Water Stop is engineered as watertight seals in poured concrete structures. PVC Water Stop is tested in factory as per ASTM & manufactured to meet the performance requirements of IS 15058/2002. Packing : It is supplied in the coil form in bundles of 25 meter to 50 meters depending on the size. Public Utilities : Bridges Road Embankments, Concrete Roads, Tunnels, Water Tanks, Swimming Pools, Municipal Hydraulic Projects, Water Filtration Plants, Sewage Plant, Clarifiers, Sewage Disposal Systems, Neutralization Tanks. One-half of the water stop is embedded in the concrete leaving the second half extended. Than second-half is also embedded leaving the centre bulb free for expansion & contraction. Care should be taken in pouring concrete without misaligning the water stop. It can be fused by heater plate at the joint by melting with care.